It’s 9 am Saturday morning and Haris‘ black Honda Transalp motorbike is ready for another run in Crete. We load the cameras and the maps and put our helmets and jackets on. Haris starts the engine and we set off. A few minutes later we enjoy a panoramic view of the Hersonissos area. It does look crowded with all these hotels and other buildings but it still looks nice from up here (the new road that bypasses Gouves and Hersonissos). Soon Hersonissos and Stalis are left behind and we turn right to Mohos. It’s a road full of curves that ascends on the steep hill above Stalis. The view is getting better and better and it’s always a pleasure to drive here, especially late in the evening. We take a break at the central square of Mohos for some photos of this picturesque little town. Mohos preserves some of its traditional style and it’s quite pleasant to spend some time here if you happen to be in the vicinity of Hersonissos, Stalis or Malia. Keep in mind that a traditional Cretan night is arranged for every Wednesday night. We keep driving past Mohos and we make one or two stops to enjoy the view of the Avdou valley beneath us. Avdou is a small town and many preserved traditional houses can be found if you wander around the narrow streets off the main road.. There are several nice kafeneia (cafes) but my particular favourite will always be Mrs. Erofilli’s because of her delicious omelette with fried potatoes (the Cretan omelet). We follow the sign to Krasi and soon we enter the pretty village. 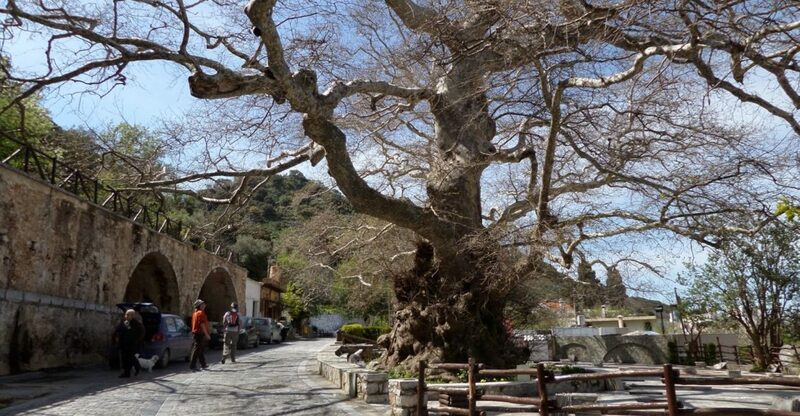 We drive all the way to the main square of the village, there where the huge „platanos“ (plane or sycamore) tree is.